Its the second semester of the Wynwood Maker Camp and I have to learn about brain waves for my project the OpenBCI. I’m not a fan about learning to be honest but this is the only way for me to move on with my project. I went on Google and searched up the different types of brain waves. I even had to write everything I learned down on my notebook. It was annoying but it was easy to find what I need. I read so much that I learned what I needed to know about each brain wave. I learned all the different types of brain waves. Alpha, Delta, Theta, Beta, and Gamma. The first wave is Delta (the deep-sleep wave). 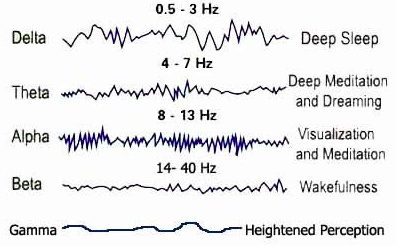 These is the waves that occur when you are unconscious or in a deep sleep. They also come in when you are in deepest meditation or sleeping. These waves are very loud but also very slow. While you are healing from any injury the Delta waves appear. Next was Alpha (the deep relaxation wave.) these waves aid calmness, alertness, mind/body integration and learning. they also heightens your imagination, visualization, memory, learning, and concentration. they are usually present when you close your eyes but not when you are sleeping. they come in when you are in light meditation or a daydream. these waves program the brain for success. The third wave was Theta (the light meditation and sleeping wave.) they mostly happen in sleep but are dominant when you are in deep meditation. these waves are like a gateway to learning and memory. they also reduce consciousness. it is also the realm of your subconscious and only experienced memory. the fourth wave was Beta (Waking consciousness and reasoning wave. )When you are alert, attentive, engaged in problem solving, judgement, decision making, and engaged in focused mental activity these waves start to kick in. they also occur when we feel tense, afraid, and agitated. they can also translate into stress, anxiety, and restlessness. Last but not least, the Gamma brain waves (the insight wave.) these waves are the fastest ones out of all of them. they pass information rapidly but the mind has to be quiet for this happen. Gamma waves can improve memory. they can also boost up your five senses. By learning about the different types of brain waves I am able to continue working on my project the OpenBCI and hopefully I will be able to finish working on this project and to open and close a gate with my mind. For now it’s not done yet but it’s a work in progress and soon it will be done for good.